Every time we travel I debate whether to buy travel cancellation insurance. Not the regular kind that requires you or your nearest relative to be near death – but the kind that lets you cancel for any reason. We have had far too many occasions where the strict conditions of regular travel cancellation insurance would not have helped. Often I am too cheap to pay for the “insurance” and the Pollyanna in me is sure nothing will happen. But I have been wrong more than I have been right. I bought the “any reason” kind when I travelled after I had surgery, sure that this pre-existing condition would negate me claiming to come home if I really was not up to the travel. But this time I didn’t need the insurance I bought. We just changed our pace and the break actually helped me to recover. I am sure the peace of mind knowing I could go home with no penalty helped. 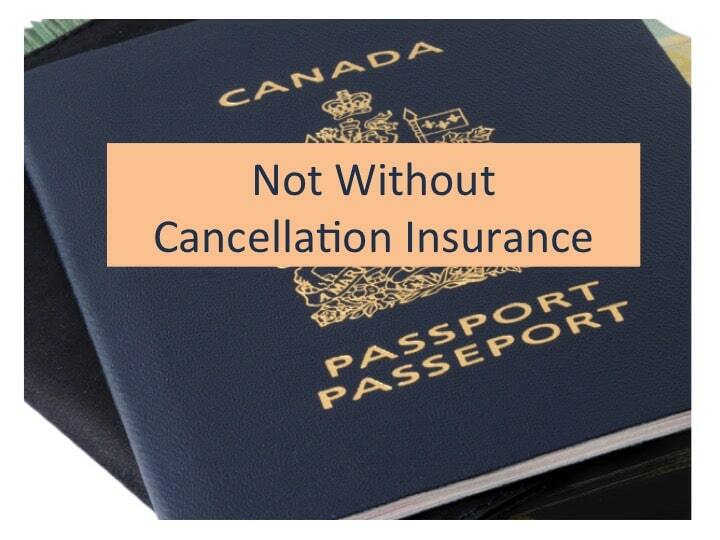 We didn’t buy travel cancellation insurance the time we booked a full 3 weeks in Europe and I had to cancel the full trip when my son got into some trouble that I wanted to be home to deal with. No regular trip cancellation insurance would have helped with that but the “any reason” type would have offset most of our losses. For years we traveled always worried that one of our elderly parents would have a problem that required our immediate return. We got lucky and never got called back. Now that we are “orphans” (all parents gone) we thought we were safe. But that call in the night can still come. Earlier this year we took a much needed two week break to Cuba (we are Canadians so Cuba is not limited for us). This was our third trip to Cuba and we had been travelling to the Caribbean for over 20 years. 3 days in I got sick – the first time ever, even with being really picky about what I was eating. On day 6 I saw the resort doctor who gave me a handful of pills and antibiotics. That night David got food poisoning from seafood. On day 7 we left the resort and flew home. I was it taking a chance with. Cuban healthcare!! Took us a day of haggling with Sunwing to get our flight back with only a minimal cost for the change in date. But the Melia Cuba resort just shrugged when we walked away from 7 days at the all inclusive resort. Of course, we had no travel cancellation insurance. We are in the middle of our 5 week west coast trip (#WCoast14) and we are daily assessing the cost of having to go home early. Of course, we didn’t buy “no reason” insurance this time! A good friend had emergency surgery and didn’t tell us until it was all done – they didn’t want us to rush back. In assessing the root cause, they have found cancer. It took us several calls to get a sense of the urgency (our first contact proved to be grossly unreliable) and we have been assured that an immediate return is not needed. We will go home when needed, regardless of cost, but had we paid the cost of travel cancellation insurance it would have eliminated additional stress. We are now starting planning for our 10 weeks in Europe in September. Before we hit “buy” for our first big cost we will buy travel cancellation insurance “for any reason”. Our reasons for wanting to go home should not be limited!